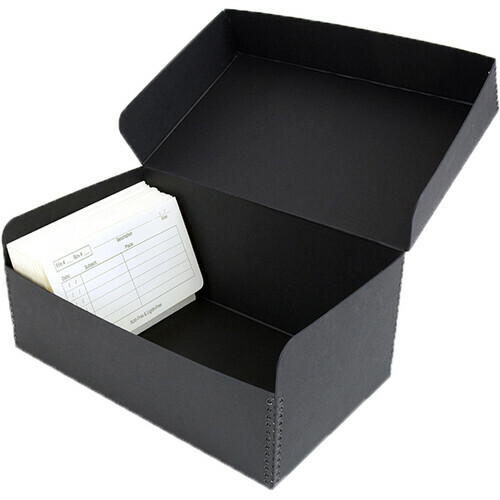 Dimensions: 7-5/8 x 5-5/8 x 5-3/8"
10-1/4 x 5-1/2 x 4-1/2"
10-1/4 x 7-5/8 x 5-5/8"
The black 7.6 x 5.6 x 5.4" Hinged Lid Box from Archival Methods is designed to archive and safely store 4 x 6" prints, envelopes, and CD cases. Also, the box can serve as a general-purpose storage box for collectibles, small pieces of art, or specimens found in nature. The lid itself has undercut front panels for easy access and more room to move materials around. The heavyweight 55 pt. ArchivalGrade boxboard is made from fully bleached, high alpha cellulose pulp, which has a minimum of 3% of calcium carbonate, and it maintains a pH value of 8 to 9.5. Moreover, the boxboard, which is suitable for long-term storage of materials, has passed the Photographic Activity Test. In addition, the paper is free of lignin, acid, recycled pulp, metal, waxes, plasticizers, bleach, and peroxide, and virtually free of sulfur. The exterior of the box is a textured surface and the colored dye is light-fast and non-bleeding. The surface of the board does not contain knots, shives, or abrasive particles that would otherwise damage the material stored inside. Meanwhile, the anti-corrosive metal-edge clamps, which have been treated with a black polyester coating and a wax-free polyester finish, have been added to the corners of the box and provide strength and rigidity to stack the boxes on top of each other. Box Dimensions (LxWxH) 8.0 x 6.0 x 5.0"